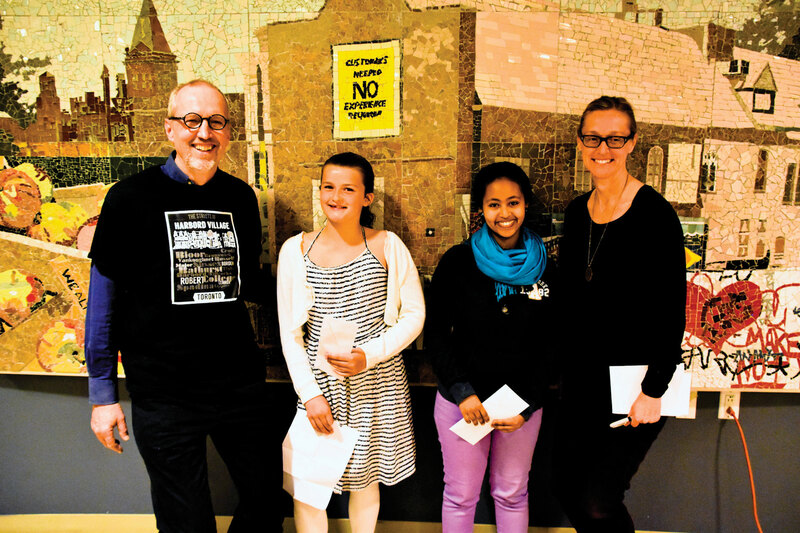 Providing a helping hand and supporting newcomers to the neighbourhood were the themes of this year’s winning entries in the fourth annual Harbord Village Residents’ Association essay contest. Open to students enrolled in Lord Landsdowne and King Edward junior and senior public schools, Kensington Community School, and Central Technical School, the essay contest asks writers “how I have made my community better”, and gives cash prizes to winners in the elementary and secondary categories. This year’s winners are 9-year-old Maya Retzleff, a grade four student at Lord Landsdowne, and Liya Tadesse, an 18-year-old grade 12 student at Central Tech. PHOTO COURTESY RICHARD LONGLEY/HVRA: Harbord Village Residents’ Association (HVRA) chair Tim Grant, contest winners Maya Retzleff and Liya Tadesse, and HVRA’s essay contest coordinator Paula Gallo pose at the association’s spring meeting. I help my community in a lot of ways, like I help my mom do part of her fundraiser for the bake sale for the school. We raised $700 for books or field trips for the whole school. I am very impressed and I think making a fundraiser was a good idea to get money for Lord Lansdowne. I also help my neighbours. I help Maria who lives next door and Rebecca. Maria is old, so I decided to shovel her pathway in the winter and in the fall I rake the path and because Maria does really nice things for me and I appreciate it so it was my turn. I help my babysitter Elizabeth shovel and they paid me $20 but instead of keeping the money, I gave the money to SickKids hospital and the money that I got when I did my other neighbour’s yard. In the same time I did a lemonade stand and it went really great. I raised $133 and half of the money went to SickKids and the other half went to the Salvation Army. I also help my mom do the spring clean-up for the community. I help with passing the gloves for the clean-up and the garbage bags and I passed out the maps to where to clean up. And when you are done you go and put it in a pile and the garbage truck comes and takes it away. I helped Scott Mission when my class did candles that we sold at a concert and we donated all of the money to Scott Mission. In fact we went to the Scott Mission and it was a cool experience. I like it when I think of it. It is a sad experience, but it is cool at the same time. And that is what I did to help my community. Toronto is one of the most known multicultural cities in the world. This is the reason why there are lots of choices on how to make communities better. I have made my community better by volunteering. I have previously volunteered at Scadding Court Community Centre with children, the Newcomers Orientation Week (NOW) program, and the Youth Advisory Group (YAG) program at Sanderson Library. What I always like to do before volunteering is to let everyone know each other because people have to know each other to feel comfortable. At Scadding Court, I plan and organize events in the summer and spring for kids. Sometimes I invite the parents to attend these events. In the NOW program, I helped newcomers to Canada with language translations and showing them places to visit. These experiences helped me to receive my leadership certificate. During my time in the YAG program, I plan and organize seasonal games and parties, for example, celebrating different country’s New Years, holidays, and watching movies. During these times, I got to learn a few hellos and goodbyes in different languages, tried foods from different cultures, and learned new things. By the end of my volunteering experiences, all these people that were shy to talk to each other became good friends with one another. It makes me happy to see my community get along with each other.